City-dwellers of Bogota, Colombia, are realizing many benefits of banning cars from city roads one day a week. Every Sunday, Bogota, Colombia bans cars from 75 miles of city roads, and more than 1.5 million people take to the streets . . . on foot and on bikes. 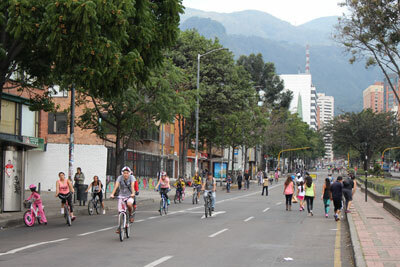 Bogota’s Ciclovía at Avenida Chile (photo credit: Wikipedia). The program is called Ciclovía and has been happening in Bogota for over 35 years. It began when the city wanted to build more parks, but didn’t have the room or money for them. Now, the roads are used as public spaces, and people can walk, bike, or participate in activities such as yoga and dance classes without fear of being hit by a car. Gil Penalosa is chair of “8 80 Cities”, a nonprofit that promotes walking and biking. He says encouraging people to hit the streets without a car has benefited Bogota in more ways than one. Aside from reducing global-warming pollution, Ciclovía improves the physical, mental, and social health of Bogota’s people. As cities around the work to build community and slow global warming, a growing number are making their streets friendlier to people, not just cars. And Bogota’s Ciclovía tradition is catching on . . . with events held everywhere from the U.S. to Belgium and Australia. Reporting credit: Lauren Smith/ChavoBart Digital Media.